Security verification on Wechat can be quite problematic at times. Especially for non-Chinese users. 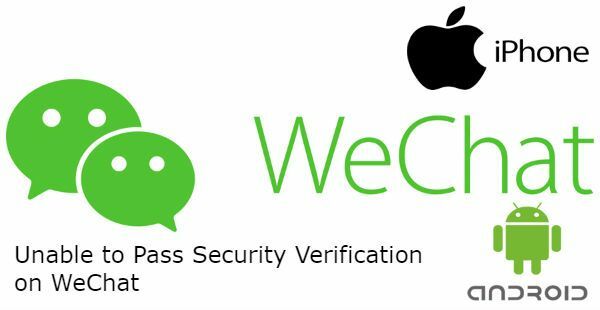 If you unable to pass security verification on WeChat, you will need to contact WeChat staff directly. One of our visitors had the similar problem with his WeChat account. Since this is an account issue, only WeChat staff can resolve the problem about security verification. Question: I’m unable to pass security verification while doing login for the first time on my LG G7. I tried security questions first, but I don’t remember the groups I was used – they are shown in Chinese letters I’m not familiar with. Then I tried restore password through email: the system says that it had sent the instructions to my email, but I did not receive anything on the email. What should I do? Firstly you will need to visit WeChat support center. Choose unable to login in select categories section. At the next field, select new device authentication. At the description field, describe your problem (Such as unable to pass security verification with detailed info). Type your phone number to “WeChat ID (or Linked Mobile Number)” field. Finally add your email address and pick email as preferred contact. Guideline for those who are stuck at security process on WeChat: Why WeChat Stops in Security Check in? You need to give all details in description part as same as you have written to us. (Like you have a new phone. You are unable to pass WeChat verification because of language difficulties) That will make things faster for you. WeChat doesn’t generally answers support requests very soon but they are going to respond you. If you are not satisfied with this answer or if you have more questions about this issue, please leave a comment. One of our staff is going to respond you as soon as possible. Also see: Can you Sign Up Wechat with Email Address?